As part of a shopping promotion, Bangkok shopping mall Central Festival unveiled billboards and ads to mark the Chinese New Year. The ad featured a white woman pulling one of her eyes. The text read, "Good to be Chinese." Understandably, people got upset. "I thought this was a joke," wrote one Facebook user, while another Facebook user, Bangkok-based Twitter Matt Crook, wondered how the campaign got approved in the first place. 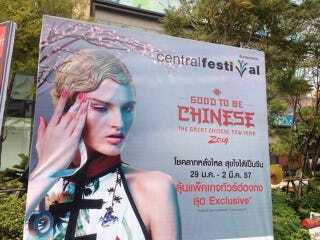 As noted on ChannelNewsAsia, lots of foreigners shop at Central and the ads drew complaints. Website Coconuts Bangkok points to a Facebook thread titled "Damn Thailand, don't you know that's racist?!" in which the reaction ranged from "This is wrong in so many ways," to "Hahahaha. Funny." What the woman in the ad appears to be doing is, of course, a long-standing racist gesture Westerners have used towards Asians. Coconuts Bangkok said the gesture isn't known to most Thais—and perhaps, that explains how the image was approved. Maybe not. The company that owns the shopping malls, Central Pattana, pulled the ads and issued an apology: "We are extremely sorry for the lack of judgement in this issue as we did not realize that the gesture of the model in the advertisement would be offensive to the Chinese communities."